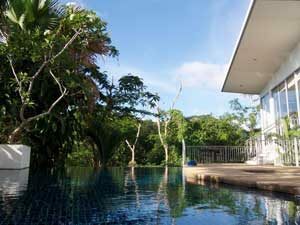 The Coolwater is a mountainside estate that overlooks the quiet and quaint Thai village of Kamala on Phuket’s west coast. Centrally located between Patong and Surin Beach, the wide sloped beach at Kamala is relatively peaceful year round. The water is clear and warm and the surf is typically gentle. It’s a perfect place for swimming and relaxing. In the green season some good surf can be found on the northern end where tourists and locals enjoy the warm summer waves. Each of The Coolwater’s contemporary hilltop residences provides the privacy of its own infinity-edged swimming pool. Elevated decks surround the exterior passageways and pools that overlook either the Andaman Sea or Kamala’s towering jungle peaks. The striking villas are set among lush tropical gardens. The finishes are modern, with many of the floor-to-ceiling windows doubling as sliding doors. You will enjoy both the tropical scenery and the cooling breezes that constantly whisper through the estate. Your view over the valley below is of swaying treetops, village scenes, and the sparkling Bay of Kamala. The setting is serene and the houses are stylish, with all the comforts of a home. The privately owned villas average well over 400 to 500 square meters, and have two to four bedrooms. They each have a western kitchen, luxurious bathrooms, and a comfortable living/dining room. There is individually controlled air conditioning throughout. 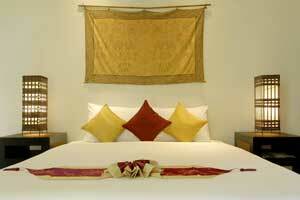 Service is provided by the on-site estate manager and her team of housekeepers, gardeners, and pool cleaners. The well-trained staff are discrete and take care to respect your privacy. A Thai chef can be hired on request to prepare an array of local cuisine or a more laid back seafood BBQ. Hover over picture for synopsis. The maid service will visit once daily to keep the villa clean and tidy. Their specific routine can be arranged on your request. Linens and towels are changed twice a week. Car rentals can be arranged right to your door. There is a motorbike for rent. Others can also be had. Reservations are confirmed upon receipt of deposit of at least 50% of total rental which should be made within 3 days of booking. Balance payment is to be made at least 30 days before arrival. Staying at The Coolwater requires a cash damage deposit of THB 20000 at check-in. (Baan Sii is THB 25000). Please remember to bring this with you. The deposit is returned to you at the end of your stay. You can also give us a equivalent amount in your home currency to save you currency conversion costs. Smoking inside is strictly forbidden and there is a 18000 THB penalty. Ashtrays are provided for smoking outside. No pets are allowed at The Coolwater, but we will consider exceptions. Guests should respect the staff and the villa as well as our neighbors. In case of unacceptable behavior or persistent loud noise, the guests will be asked to leave without compensation. See more details in our Guest Guide. Deposit payment and balance payment are non-refundable unless another booking can be confirmed on the same dates for the same rates. Guests keep the amount paid as credit for one year with the possibility to schedule another stay. Guests are requested to send a detailed email with their reason for cancellation as soon as possible. amazing villa in the hills with incredible staff! The Coolwater is located in beautiful Kamala Beach on Phuket Island - in Thailand, the Land of Smiles.